The cognoscenti in Jerusalem call things by their old names. Our office, for example, at the corner of King George and Hillel Streets was across from the “old Knesset”. For the record, the Knesset hasn’t been there since 1966. My first trip to Israel was in 1967, but I learned to refer to the building as the old Knesset. When my boss was growing up in the late 1940s and early 1950s, his family thought that Jerusalem’s Rehavia neighborhood—where much of the Ashkenazi elite of the time lived–was too far from the location of my boss’s father’s barber shop–that is, the building that housed my office in the early 1990s. It would have been a leisurely 15 minute walk to the far reaches of Rehavia from this downtown location. Instead, their family lived a block away from the office at the corner of King George and Ma’alot streets so that his father could go home for lunch and an afternoon siesta back in the pre-air conditioning days when every shop in Israel closed down from 1:00-4:00 pm. 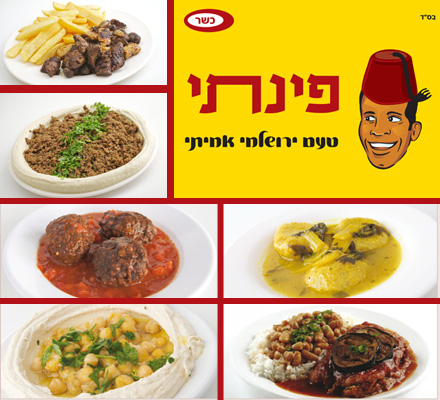 The best lunch place downtown was Pinati, where most days there were two items on the menu: hummus or hummus with meat; and on Tuesdays and Wednesdays, they served kubbe soup. (Well, it’s possible that there were other items on the menu, but no one I knew ever ordered them). I started to go to Pinati regularly with a group of friends although hanging out with friends was a violation of the Pinati ethos of eating quickly and making room at the communal table for the next people. We used to joke that you would be kicked out if you brought a newspaper, that is, if you exhibited signs of settling in and staying too long. A few other places serve meat and hummus, but none are as good as Pinati’s heaping ground beef on top of fresh hummus. In fact, most other places I’ve been to serve shwarma meat on their hummus and that is just not as good. One habit I did not pick up from my boss was the afternoon nap, which he took in his office every day. Frankly after eating hummus with ground beef as your mid-day meal, you need a nap but, well, I lived too far from the office. Pinati is now a chain in Israel but the original Pinati was a few blocks away from my office, at another corner of King George Street—which is how it got its name, since Pinati means “my corner.” I have tried to replicate the taste of that beef but these days, I try to eat less beef and have come up with a recipe with ground turkey. I’m not going to pretend that it tastes exactly like beef, but I recently discovered that a judicious amount of pomegranate molasses gives the turkey a meatier flavor and appearance. This is an easy recipe for a weeknight meal and you might not even need the nap. 1 tablespoon pomegranate molasses (you might want more but taste carefully—different brands have different levels of viscocity and tartness and you don’t want to overdo this—although the hummus will mellow the tartness a bit). Heat the oil in a large saucepan or chef’s pan. Add the ground turkey and stir so that you remove the lumps. Continue to let it brown on all sides, stirring occasionally s that you have cooked it almost all the way through. Add spices and continue to cook. Mix in pomegranate molasses so that the color coats all of the turkey. Spread the hummus on a serving platter and then heap the cooked turkey on top. Serve with warm pita and pickles. This can be a great appetizer or a week night dinner. If you want to make it with beef, follow the same recipe, eliminating the pomegranate molasses. you are a wonderful writer. I just ate dinner and I still want to run right out and eat hummus with ground turkey and molasses. Very kind of you to say so. 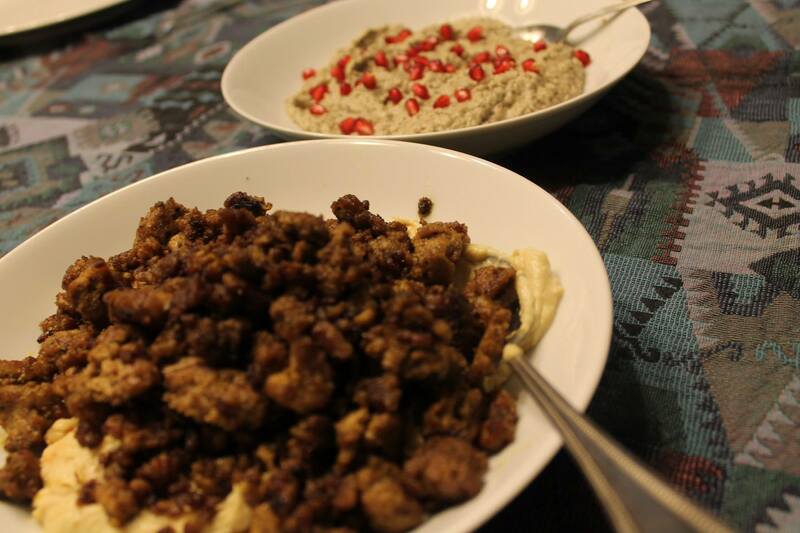 And you should run out for some ground turkey and pomegranate molasses–if not tonight, then some time soon. You won’t be sorry!